This week's show is with my soul sisters Joy and Roslyn join me on Joy Of Union featuring Joy Regina Melchezidek, her kick in the side, or sidekick TJ, and the amazing Roslyn. Roslyn has been in communication with Mary Magdalene's mother, Mary the elder. This week Roslyn channelss Mary the elder and we find out more about her daughter, her own journey, and Jesus. Mary the elder's message is one of love and truth. So many are back at this time who were connected to that time period. This week's show is Angelic Encounters with Reverend Debby, myself and special friend Sandy Anderson. Sandy shares her story about surviving cancer for 50 years. She first got sick when she was 9 years old in 1962. Sandy felt she was going to die and one night had a visit from an angelic being that told her she had a choice. "You can live if you choose." We get to choose life? We actually have an option? Nothing, even horrible disease, is by accident? Sandy also believes if you do get sick the best thing you can do is talk to survivors, don't listen to the naysayers if you "choose" to live. Why do these things happen? One might say so that we can teach and learn, and just experience all of life and get past fear. As of today, 11-13-13 Reverend Debby informed me she has to go to the hospital for a procedure, my love and light go with her. This is my second interview with William Konkolesky, State Director of Michigan MUFON. Originally I figured we'd talk about UFO investigations in the last year or so but when Bill started telling me about his own experiences and that he had a book he self published I wanted to hear more. Bill revealed to me that he has been taken, he has memories that date back to his childhood. I've always wondered why some people have unpleasant experiences while others seem to experience something totally different. Jim Marohney comes to mind, he had an incredible experience with what are termed Grays. Perhaps last week's guest, Lisette Larkins can shed some light on that. Bill's experience seems to be somewhere in between. 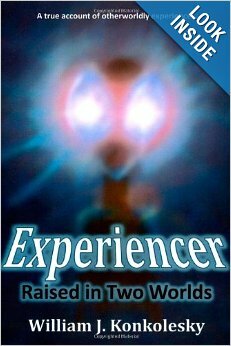 William Konkolesky's self published book is called: Experiencer Raised In 2 Worlds. Fascinating. Should you want to report a sighting or an experience and be be treated with respect go to the link below. You will also can remain anonymous if you choose.